Customizable alerts can be set to flag instances in which reported scores by a client for a given metric or behavior are outside of a specified norm. The norm is based on the score’s deviation from the mean. 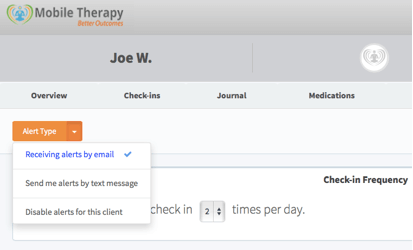 For example, if you create a flag for Anxiety with the upper threshold of 80%, the alert will be triggered when the client’s reported score is an outlier that falls outside of 80% of the sample distribution. This helps you to quickly identify anomalies or critical events and efficiently review client data or monitor high-risk individuals. We are currently working to provide optional email and sms text message alerts.